Almighty God, by whose grace and power thy holy martyr Alban triumphed over suffering and was faithful even unto death: Grant to us, who now remember him with thanksgiving, to be so faithful in our witness to thee in this world, that we may receive with him the crown of life; through Jesus Christ our Lord, who liveth and reigneth with thee and the Holy Spirit, one God, for ever and ever. Amen. Almighty God, by whose grace and power your holy martyr Alban triumphed over suffering and was faithful even unto death: Grant to us, who now remember him with thanksgiving, to be so faithful in our witness to you in this world, that we may receive with him the crown of life; through Jesus Christ our Lord, who lives and reigns with you and the Holy Spirit, one God, for ever and ever. Amen. This commemoration appears in Lesser Feasts & Fasts 2018 with revised lessons. There were probably Christians in the British Isles already in the first century. However, Alban is the first recorded Christian martyr. The traditional date of his death is 304, during the persecution under the Emperor Diocletian; but many scholars now date it as around 209, during the persecution under the Emperor Septimius Severus. Alban was a pagan, and a soldier in the Roman Army. He gave shelter to a Christian priest who was fleeing from arrest, and in the next few days the two talked at length, and Alban became a Christian. When officers came in search of the priest, Alban met them, dressed in the priest's cloak, and they mistook him for the priest and arrested him. He refused to renounce his new faith, and was beheaded. 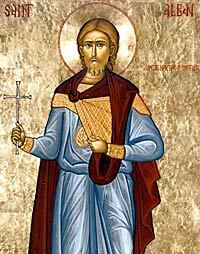 He thus became the first Christian martyr in Britain. The second was the executioner who was to kill him, but who heard his testimony and was so impressed that he became a Christian on the spot, and refused to kill Alban. The third was the priest, who when he learned that Alban had been arrested in his place, hurried to the court in the hope of saving Alban by turning himself in. The place of their deaths is near the site of St. Alban's Cathedral today. A short history of St. Alban may be found at St. Alban's Cathedral website.